The software company is growing fast as it completes its transition to SaaS, but its valuation is optimistic to say the least. Shares of Adobe Systems (NASDAQ:ADBE), best known for ubiquitous creative software like Photoshop, have soared over the past five years, more than tripling in that time. The company has aggressively transitioned its business to a subscription-based model, where customers pay for its software monthly instead of buying perpetual licenses up front. Revenue and profits have taken a hit as the move to subscriptions has pushed out revenue recognition, but Adobe expects rapid earnings growth through fiscal 2016. Non-GAAP earnings are expected to reach $3 per share in that year, up from just $1.29 per share in fiscal 2014. The market is giving Adobe a fairly lofty valuation. The stock trades for around $81 per share, or about 27 times the company's estimate for non-GAAP earnings in 2016. This isn't out of line for a fast-growing SaaS company, but a portion of Adobe's earnings growth is simply the company getting back to where it was before the transition to subscriptions. Once that transition is complete, earnings growth could slow down considerably. 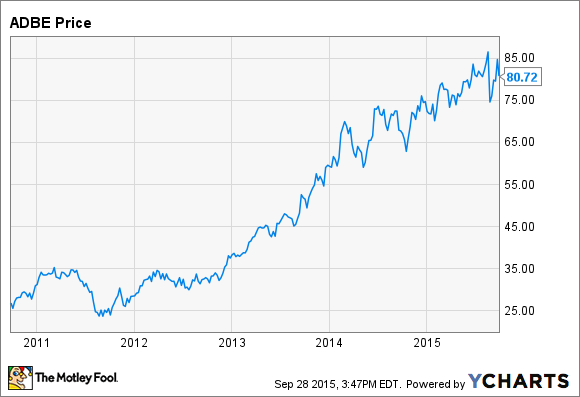 Here's why shares of Adobe may be wildly overvalued. Like many tech companies, Adobe reports non-GAAP earnings, which add back a sizable stock-based compensation expense. GAAP earnings, on the other hand, treat stock-based compensation as a real expense, as it should be, but include other charges, namely the amortization of intangibles, that can often be safely excluded. To determine whether Adobe's stock is overpriced, we need to first agree on which earnings number to use. The difference between GAAP and non-GAAP earnings is significant. For the full year, Adobe expects GAAP EPS of $1.20, while non-GAAP EPS is expected to be about $2.05. Neither one of these numbers are particularly representative of Adobe's true profitability. A better number would be GAAP earnings with amortization of intangibles added back, adjusting for taxes. This non-cash charge results from acquisitions, and it has a finite lifetime. Making these adjustments, Adobe's real earnings come out to about $1.42 per share for fiscal 2015. Adobe hasn't given guidance for GAAP earnings beyond this year, but if we assume that the percentage difference between these real earnings and non-GAAP earnings remains the same, real earnings for fiscal 2016 come out to about $2.10 per share. This puts Adobe's forward P/E ratio based on this number at roughly 40. Does the valuation make any sense? Given how fast Adobe is currently growing, a forward P/E ratio of 40 may not seem all that unreasonable. Still, there a few things investors need to be aware of. First, there are only so many potential customers for Adobe's creative software. While moving to a subscription-based business model removes the high up-front cost, potentially expanding the customer base, there are only so many people and companies willing to pay $50 per month for Adobe's creative software. The company expects its digital media segment to grow by 20% annually through 2016 as customers transition from perpetual licenses, but after that, growth will likely be slower. The second issue is Adobe's digital marketing business. Adobe expects its Marketing Cloud revenue to grow by 25% annually through 2016, and it could very well continue to grow rapidly for years. But Adobe doesn't have the same dominance in this business as it does in its creative software business, and that means it may not be as profitable. In fiscal 2014, the digital media business recorded a gross margin of 94%, while the digital marketing business had a gross margin of just 66%. While Photoshop and Illustrator are industry standards with little serious competition, the digital marketing industry is much more competitive, with big names like Salesforce in the mix. Adobe has become a SaaS company over the past few years, and its market capitalization has exploded as a result. But the only thing that's changed is how Adobe's customers pay for its software, and that alone doesn't justify a tripling of the company's market capitalization since the end of 2011. Adobe's valuation makes some pretty big assumptions about future growth, and while it's certainly possible the company keeps growing earnings at a breakneck pace, I suspect investors will be disappointed beyond 2016.